Forget the HomePod or the latest version of iOS. The big news out of WWDC was related to something that Apple, and most consumers, don’t really care about: Virtual Reality. In between Kaby Lake refreshes and Siri voice demos, Tim Cook announced a wide range of software and hardware changes that will finally bring VR to macOS, and that’s pretty damn surprising because Tim Cook himself is on record as giving exactly zero shits about VR. “VR, I think, has some interesting applications, but I don’t think it’s a broad-based technology,” Tim Cook told reporters during an Apple earnings call last October. At the time Cook was talking up AR, a technology that Apple embraced Monday with the announcement of the ARKit. So what’s prompted Tim and company’s sudden change of heart? Because VR was smeared all over the Monday keynote, mentioned not just in the announcements of SteamVR compatibility in macOS (this means the HTC Vive will work on a Mac) or a “External Graphics Developer Kit” (a new box made by Sonnet that uses Thunderbolt 3 to boost a computer graphics capabilities), but also in the announcements of updated iMacs and the new iMac Pro. A lot of it might be about wooing back the creative professionals Apple has ignored in favor of iPhone users. Apple first acknowledged that its relationship with that community was a problem back in March when it held a carefully cultivated press event just so it could promise a new MacPro was coming...eventually. But Apple’s competitors aren’t going to wait for whatever hyper-engineered desktop the Cupertino-based company has cooking. Last year, Microsoft swooped in with the launch of the Surface Studio. 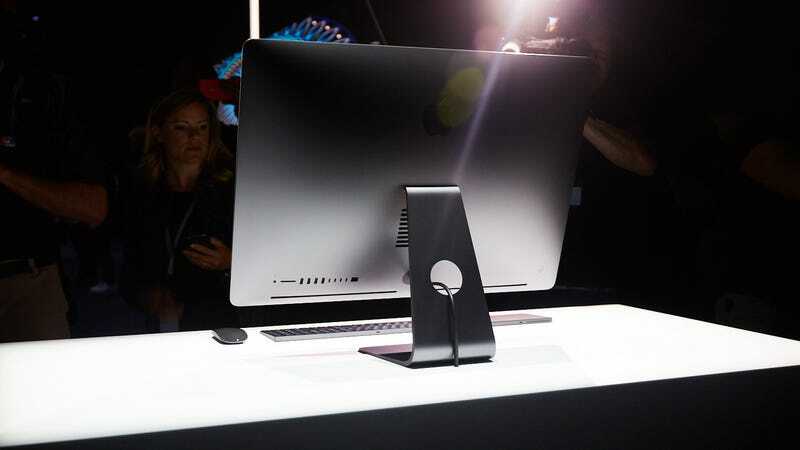 The big, gorgeous workstation was so impressive, the even allegiant Apple fans were interested. It wasn’t particularly powerful, but it was flexible, able to be used in a variety of positions, and the Dial—a small peripheral that could be used onscreen or off to quickly adjust app settings—gave pros a whole new way of interacting with the programs they lived in. All of Apple’s new products feel like a way to curb Microsoft’s inroads. Where Microsoft focused on design with the Surface Studio, Apple’s leaning on power with the iMac Pro, packing an up to 18-core Xeon processor and next-generation AMD Vega GPU into a desktop as thin as a stack of pancakes. And, as noted before, the company is also leaning on VR, and all the powerful machines that can tackle it. That was very apparent after the keynote, when press were ushered into a dark room full of demos. While many clamored for a glance at a non-functioning HomePod, the majority of the demo room was given over to the cooler tech Apple announced. “This is for professionals,” an Apple rep told me, just before he slipped an HTC Vive headset over my eyes and put me face-to-face with all seven feet of Darth Vader. It was nearly identical to the Vader demo we all saw on stage during the keynote. The purpose, according to the rep, was to show off how smoothly VR could work on macOS High Sierra and with current Apple hardware, like the 5K iMac. “They can develop on an iMac,” he said, referring the class of developers who need a machine that can crunch the big numbers that come with 3D rendering like that found in the Star Wars demo. A WWDC attendee checks out 360 video on the Vive. Besides the long row of current generation iMacs ready to show off VR demos, there was another long table of MacBook Pros lashed to external GPU boxes. The boxes were there to show off the new “external graphics” dev kit Apple announced during the keynote, but according to Apple reps, any external GPU that connects via Thunderbolt 3 should, theoretically, work in Apple’s macOS ecosystem. The Sonnet box, packed with a video card an AMD Radeon RX 580 8GB video card. External GPUs aren’t new. Both Alienware and Razer have been pushing their boxes (the Graphics Amplifier and Core respectively) on gamers. For those companies the external GPU is a great compromise. You can have a super light laptop with great battery life when you’re on the move, and a computer as powerful as a desktop when you get home. Perfect not just for the VR fans and gamers Apple nodded at, but for creative professionals who need the extra GPU oomph for 3D renders. Perhaps Apple’s sudden interest in VR has nothing to do with courting professionals. Maybe it really is about the masochist gamers who want to game on a platform rarely supported by video game developers. But, at least from what we’ve seen so far, that doesn’t seem to be the case. Instead, it seems that Apple’s focusing on VR because it is well aware of the fact that it can’t keep ignoring the pro users that helped bolster Apple’s cachet as a cool company in the first place.